Bully Beef Stew. Three Aboriginal Men is an original play written by Andrea James, Sonny Dallas Law, Colin Kinchella and Bjorn Stewart. A fearless theatrical exploration of Aboriginal manhood. Three young Aboriginal men, Sonny Dallas Law, Colin Kinchela and Bjorn Stewart have been working together with Director Andrea James to transcend usual notions of what it is to be an Aboriginal man today. Drawing on their own personal experiences and taking inspiration from their fathers and other Aboriginal men in their lives, past and present, they have cooked up a performance that promises to feed your heart and soul. At times achingly beautiful – at others, raw and exposed – these men bring to the stage a resounding spirit, a dreaming – an initiation of sorts. Commissioned by and first performed at PACT centre for emerging artists in June 2011. Dramaturg and Director Andrea James, Choreographer Kirk Page, Media Artist Jacqui Mills, Sound Designer Melissa Hunt, Lighting Designer and Production Manager Clytie Smith, Production Stills Heidrun Lohr, Videographer Sam James. Cat Jones, PACT’s Artistic Director commissioned Bully Beef Stew. Three Aboriginal Men and was Creative Producer and promotional photographer for the production. The work has since been published as part of Blakstages and an excerpt has featured in the touring exhibition Thank You for the Days: My Teenage Years by Djon Mundine beginning with Lismore Regional Gallery 2012. This performance is available for tours – please contact PACT centre for emerging artists for the tour package and further information. 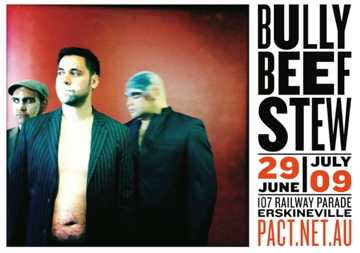 Bully Beef Stew Trailer from PACT centre for emerging artists on Vimeo.